Don't let the photo fool you, I found this wandering coyote in a much more urban environment than it looks like. On my way home later afternoon yesterday by Hwy 7 & 427 I happened to notice in the corner of my eye something moving. 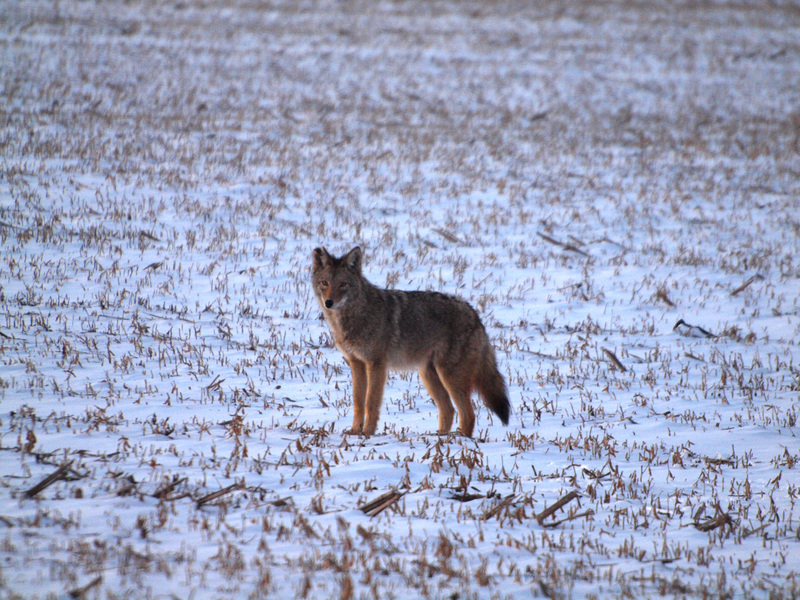 When I stopped I was surprised to find a very healthy looking coyote staring back at me. Given that there has been so much development lately in the area with the new Vaughn Industrial park, new commercial building at Hwy 50 & 7 and new subdivisions going in on Hwy 50 just a little north I didn't expect to see a coyote wandering around so freely in an area that is starting to become a lot busier. This was the first time I had gotten a good close up look of one in a long time, he appeared much more healthy looking than then ones I see near my house up further north in Caledon, I guess there is more urban garbage to feed on. Photo was taken with my 70-300mm zoom lens and the lighting was only slightly adjusted in Photoshop, click on the above photo for a larger image. Posted: January 11th, 2010 under Photos, Wildlife. Nice blog mate keep it going. I live right near where you speak, i hear coyotes howl every night. It’s the conservation land by mcvean and queen where the majority of them are.